Canadian tangler Cyndi Knapp shares her delicate Ila tangle with us this fine Monday in June and it’s her seventh tangle on the site. Ila is a perfect Monday tangle because it’s so easy, so simple, and yet has so many creative and elegant possibilities. As with most of my others, this pattern came to me while tangling. Its simple elegance reminded me of my Great Aunt’s incredible hand tatted lace, so I named it Ila in memory of her. Tatting may have developed from netting and decorative ropework as sailors and fishermen would put together motifs for girlfriends and wives at home. Decorative ropework employed on ships includes techniques (esp. coxcombing) that show striking similarity with tatting. Tatting with a shuttle is the earliest method of creating tatted lace. A tatting shuttle facilitates tatting by holding a length of wound thread and guiding it through loops to make the requisite knots. Historically, it was a metal or ivory pointed-oval shape less than 3 inches (76 mm) long, but shuttles come in a variety of shapes and materials. Shuttles often have a point or hook on one end to aid in the construction of the lace. Antique shuttles and unique shuttles have become sought after by collectors — even those who do not tat. 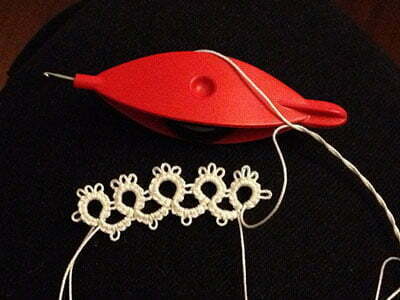 To make the lace, the tatter wraps the thread around one hand and manipulates the shuttle with the other hand. No tools other than the thread, the hands and the shuttle are used, though a crochet hook may be necessary if the shuttle does not have a point or hook. In an email exchange with Cyndi I wondered if people still did tatting any more and she replied “Who knew but it seems tatting is still alive!!”. She included a link to an article in Canada’s Maclean’s magazine, “Tatting Tales: not just for grannies any more”. The article begins with an exquisite example of a modern tatted lace choker and contains information on several tatting blogs and YouTube video resources you might like to check out. And dig out your shuttles. Uncomplicated to tangle, it gives a lovely ribbon effect. It’s easily varied and takes on a different personality when aura’d (Step 5). The illustration demonstrates possible variations and double aura effects with a blackened background. For my example, inspired by Cyndi’s use of perfs I embellished Ila with tiny open perfs to emphasize its lace-like quality. 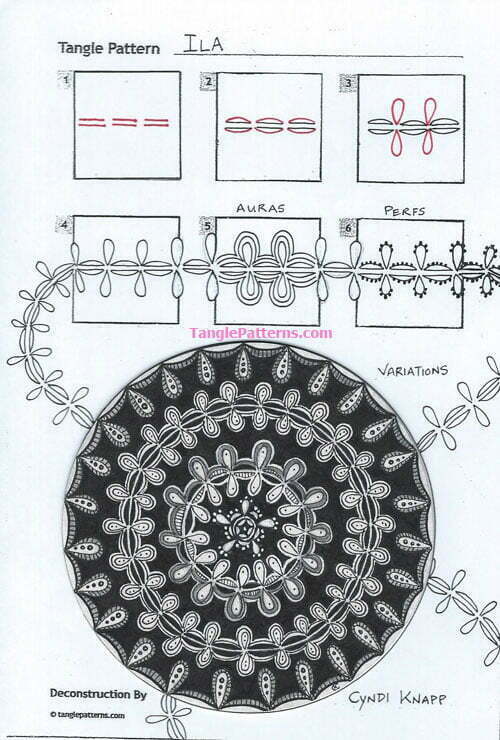 Cyndi illustrates the step-by-step instructions for drawing Ila below and to see how Cyndi embellishes Ila in a variety of ways including using the Zentangle-enhancers perfs and auras in her pretty, doily-like black and white Zendala. Image copyright the artist and used with permission, ALL RIGHTS RESERVED. Please feel free to refer to the steps images to recreate this tangle in your personal Zentangles and ZIAs, or to link back to this page. However the artist and TanglePatterns.com reserve all rights to these images and they must not be publicly pinned, altered, reproduced or republished. They are for your personal offline reference only. Thank you for respecting these rights. Click the image for an article answering common myths from the internet about copyright. fun pattern. In the tatting world those Perfs would be Picots. I am going to try it tonight, right after I pull out my shuttle and start a new project. Thanks for motivating me to start tatting again! There are numerous tatting tutorials and patterns on YouTube, as well as ones on how to do needle tatting, and cro-tatting, if one wants to get into those alternatives of the same art form :-). I like to draw Zendala’s and this is a beautiful tangle to use therefore. Thank you very much! This is a great tangle. It’s easy enough and can be drawn quickly. It’s customizable easily with variations you pointed out. Another reason this tangle impresses me: The name you gave it “ILA” is my mother’s name. Ila Rose. So everytime I draw this tangle I will think of you, the creator, and my mother. Thank you very much. Love this one. Reminds me of my Mother and Grandmother working on tatting. so fun and easy with two lovely variations. I tried tatting many years ago too. Did some snowflakes so this will be a fun tangle to do on a zendala or in the round on some cards for the holidays. Thanks for the share.